The Finnish Army (Finnish: Maavoimat, Swedish: Armén) is the land forces branch of the Finnish Defence Forces. Today's Army is divided into six branches: the infantry (which includes armoured units), field artillery, anti-aircraft artillery, engineers, signals, and materiel troops. The commander of the Finnish Army since 1 August 2017 is Lieutenant General Petri Hulkko. In addition to these tasks, the Army is responsible for conscription and personnel management of reserve. Because Finland is not under direct military threat, the current Army is, as it has been since the end of Second World War, in peacetime training formation. This means that its brigades (Finnish: joukko-osasto) are not meant to be operational combat units but training formations. According to the "troop production" doctrine (Finnish: joukkotuotanto), peacetime units will train each batch of conscripts they receive for a specific wartime unit. After the end of training, the conscripts are demobilised into reserve. During regular refresher exercises and in case of a crisis, the reserve unit will be activated and deployed in the formation it trained in during conscription. Thus, the peacetime structure of the Army does not give any meaningful information about the mobilised structure or about the areas where the units would be used. Between 1809 and 1917 Finland was an autonomous part of the Russian Empire as the Grand Duchy of Finland. Between 1881 and 1901 the Grand Duchy had its own army. Before that several other military units had also been formed while Finland belonged to Sweden. The Grand Duchy inherited its allotment system (Swedish: indelningsverket; Finnish: ruotujakolaitos) from the Swedish military organization. However, for several decades, Russian rulers did not require military service from Finland; operations and defence were mostly taken care by Russian troops based in the Grand Duchy. As a result, officer benefits of the allotment system became practically pensions, as payment was based on passive availability, not on actual service. During the Napoleonic Wars three 1200-man regiments were formed in Finland and Topographic Corps in Hamina. In 1821 the Topographic Corps was transformed into the cadet officers school. In 1829 one of the training battalions was transformed into the Young Guard Battalion, the Finnish Guard. During the Crimean War, 1854, Finland set up nine sharpshooter battalions based on a rota system. Conscription was introduced in Finland in 1878. The Finnish Guard took part in fighting to suppress the 1830 November Uprising in Poland and participated in the Russo-Turkish War (1877–1878), after which it gained the status of Old Guard of the Russian Emperor. The Finnish army was gradually broken up during the "oppression years" just after the turn of the century. As Finnish conscripts refused to serve in Russian Army, conscription ended in Finland and it was replaced with a tax paid from the Finnish Senate to the Imperial treasury. At the turn of the 20th century, the Russian empire was weakening, and this was reflected in a reduced capacity of the Russian troops to keep public order. Voluntary defence organizations disguised as fire brigades were formed by the Finnish people, especially during the strikes during and after the Russo-Japanese War. There were socialist Red Guards and conservative, anti-socialist Protection Guards (or White Guards). Also, during the First World War activists secretly travelled to Germany to receive military training and to be trained as Jäger troops (in finnish jääkärit, in swedish jägare). After independence and beginning of the Finnish Civil War the White government declared the White Guards as government troops, and the war was fought between the Red Guards, assisted by Communist Russians, and White Guards added with the Jägers and assisted by the German Empire. After the war in 1919, the Protection Guards became a separate organization. Therefore, strictly speaking, there is no continuity between the White Guards, which became a voluntary organization, and the Finnish army, which was a cadre army based on conscription. However, Jägers gained important positions in the army, and German tactics and military principles were adopted. Finnish troops at a machine-gun post during the Winter War. The Finnish Army consisted of 9 field divisions, 4 brigades and a number of small independent battalions and companies at the beginning of the Winter War in 1939. The Army was organised into three corps. The II and III Corps were organised into the Army of the Isthmus which was located on the Karelian Isthmus, the likely location for the main Soviet attack. The IV Corps defended the area north of Lake Ladoga. The defence of the rest of the border up to Petsamo by the Arctic Ocean was given to the North Finland Group which consisted of a handful of independent battalions. 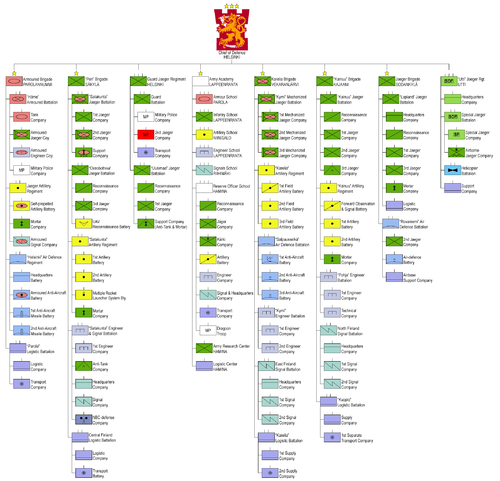 In order to organize replacements for the units a Field Replacement Brigade (Kenttätäydennysprikaati, KT-Pr) of nine battalions was formed. But due to the severity of the Soviet attack the battalions had to be used as combat troops. Also three Replacement Divisions or Home Replacement Divisions (1.Koti.TD – 3.Koti.TD) were formed from the available reservists. As the situation became more alarming the 1st and 3rd Replacement Divisions were reformed into the 21st and 23rd Divisions and sent to the front on 19 December. The 2nd Replacement Division was deployed as individual regiments to Northern Finland. Army of the Isthmus (Kannaksen Armeija, KannA) under Lieutenant General Hugo Österman was located on the Karelian Isthmus. III Corps (III AK) under Major General Erik Heinrichs. Finnish Leopard 2A4 at the Independence Day Parade. Four delaying groups, named for their location, were stationed immediately by the border on the isthmus. IV Corps (IV AK) (in the Ladoga Karelia) under Major General Juho Heiskanen (from 4 December 1939 on Major General Woldemar Hägglund). North Finland Group (Pohjois-Suomen Ryhmä) under Major General Wiljo Tuompo. Mannerheim awarding Mannerheim Crosses to soldiers. 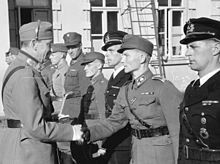 He is congratulating cadet Yrjö Keinonen, who later became Finnish Chief of Defence. The Army of Karelia was formed on 29 June 1941 soon after the start of the Continuation War. There were seven Finnish corps in the field during the war: the I, II, III, IV, V, VI and VII. 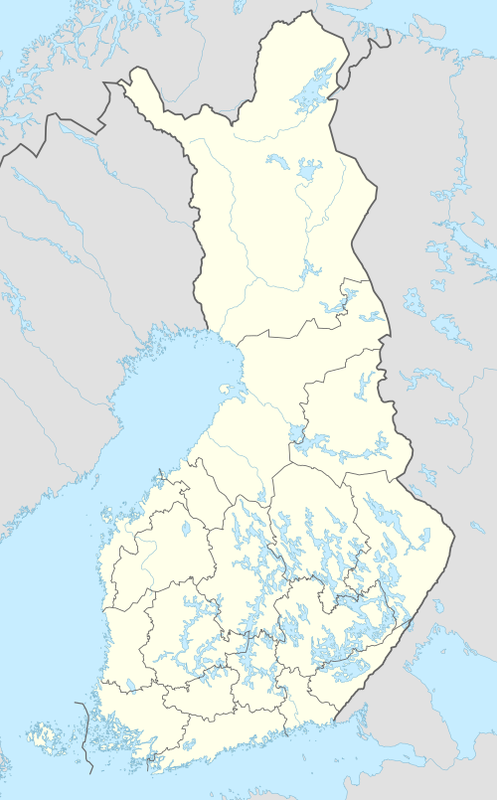 During the war, the Finnish Army was responsible for the front from Gulf of Finland to Kainuu. The front in the Northern Finland was the responsibility of German AOK Norwegen. During summer and autumn 1941, the Finnish Army re-conquered the areas lost to the Soviet Union in the Winter War and pushed deep into Soviet territory in Eastern Karelia. In winter 1942, the Finnish political leadership ended offensive action and the front stagnated for over two years. The relatively inactive period of stationary war ended abruptly in June 1944, as the Soviet Union started its Fourth Strategic Offensive. As a result, the Finnish Army lost large areas of the Karelian Isthmus, most importantly Viipuri, a major city, and was forced to retreat from Eastern Karelia. However, in the decisive Battle of Tali-Ihantala, the Soviet advance was halted. The Soviet Union concentrated its forces for the battles in Central Europe, and Finland made a separate peace in September 1944. The Lapland War (Finnish: Lapin sota) was the hostilities between Finland and Nazi Germany between September 1944 and April 1945, fought in Finland's northernmost Lapland Province. While the Finns saw this as a separate conflict much like the Continuation War, German forces considered their actions to be part of the Second World War. A peculiarity of the war was that the Finnish army was forced to demobilise their forces while at the same time fighting to force the German army to leave Finland. The German forces retreated to Norway, and Finland was therefore able to uphold its armistice promise to the Soviet Union. The Army is organised into eight Peacetime brigades. Two of these brigades, Army Academy and Utti Jaeger Regiment do not have subordinate regional offices. The six other brigades have one or more subordinate regional offices and a deputy commander. During a crisis, the regional offices form provincial local battalions and the brigade headquarters form the regional command level. During normal situation, the regional offices are responsible for conscription, organising voluntary national defence work and planning crisis time activities. Army logistics is part of the joint Finnish Defence Forces Logistics Command. During war time the army is organised operative forces which consists of approximately 61 000 men and territorial forces which consist of 176 000 men. ^ "World Air Forces 2017". Flightglobal: 9. Retrieved 10 February 2017. ^ Finnish Defence Forces Logistics Command. Finnish Defence Forces 2014-12-19. Retrieved on 2015-06-19.